Peptest – the accurate, painless and inexpensive saliva test that tells you conclusively if you have reflux – is now available in Jordan. RD Biomed has partnered with pharmaceutical distributor Nebras Jordan to launch the Peptest reflux diagnositc test in the country. 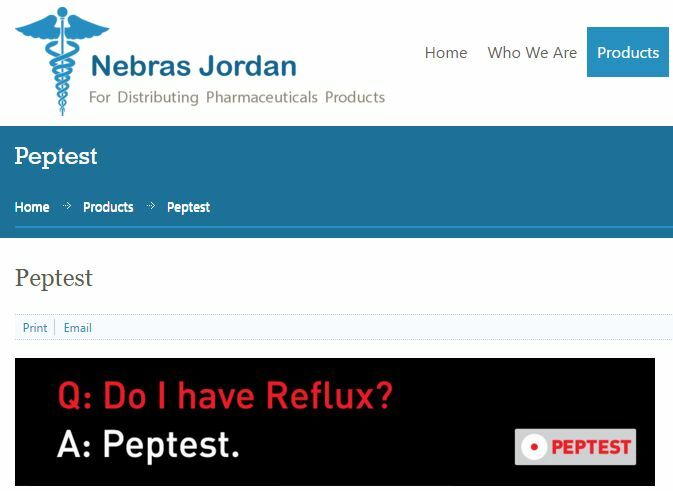 Nebras Jordan has registered Peptest with the country’s regulatory body Jordan Food and Drug Administration (JFDA), secured distribution channels with four laboratories and arranged insurance. Nebras Jordan will now work closely with doctors across the country to demonstrate the benefits of Peptest, which measures the presence of the digestive enzyme pepsin in saliva, which is a reliable marker for the reflux of gastric juice. Gastroesophageal Reflux Disease or GORD is known for causing heartburn but when it reaches the throat and beyond (Airway Reflux or Laryngopharyngeal Reflux (LPR) it can cause a variety of other symptoms. Dr Feras Zuriekat in Jordan, said: “We are delighted to have Peptest in Jordan; reflux is a disease on the rise worldwide, it affects the quality of life of patients and could have serious consequences, such as increased risk of oesophageal and laryngeal cancers. Managing reflux can be challenging and Peptest is a very useful non-invasive tool that will help clinicians to diagnose and follow up patients. Medical professionals can order Peptest via Nebras, which will locate the nearest laboratory where Peptest is available. Peptest is now available in more than 20 countries including China, India, Spain, Italy, Ireland and the UK. Nebras is specialised in marketing and distribution of pharmaceutical products, food supplements and medical supplies.